Last summer, our team took a field trip to San Francisco and Chicago, to catch up with our Chief Tinkerer (GP) and learn from interesting schools and organisations at the forefront of education. What we learned was too important to just stay in our team, so we’re taking to the blog to share some of the insights from our travels with the Saturday Kids community! Through GP, we got to know of the New School San Francisco which practises inquiry-based learning. 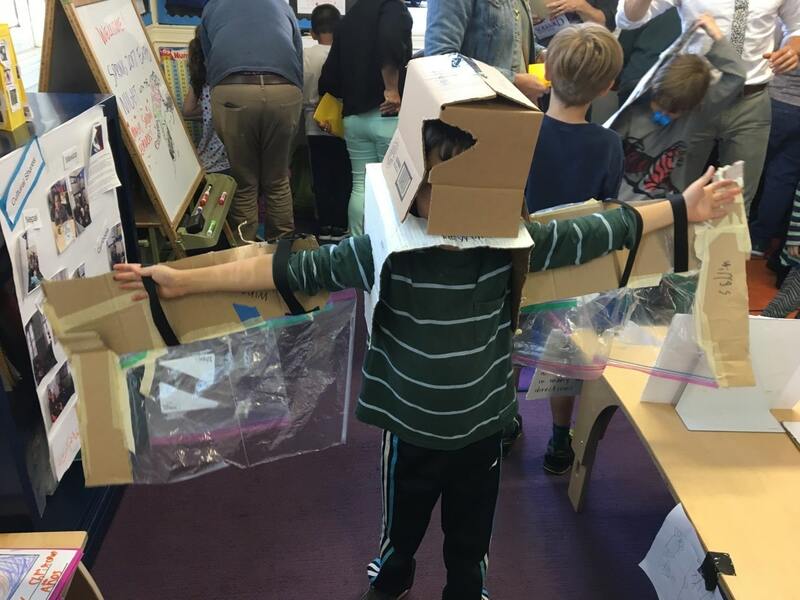 Here, he shares his perspective as a parent on what inquiry-based learning entails, why it’s important, and some ways to incorporate it into how our kids learn. 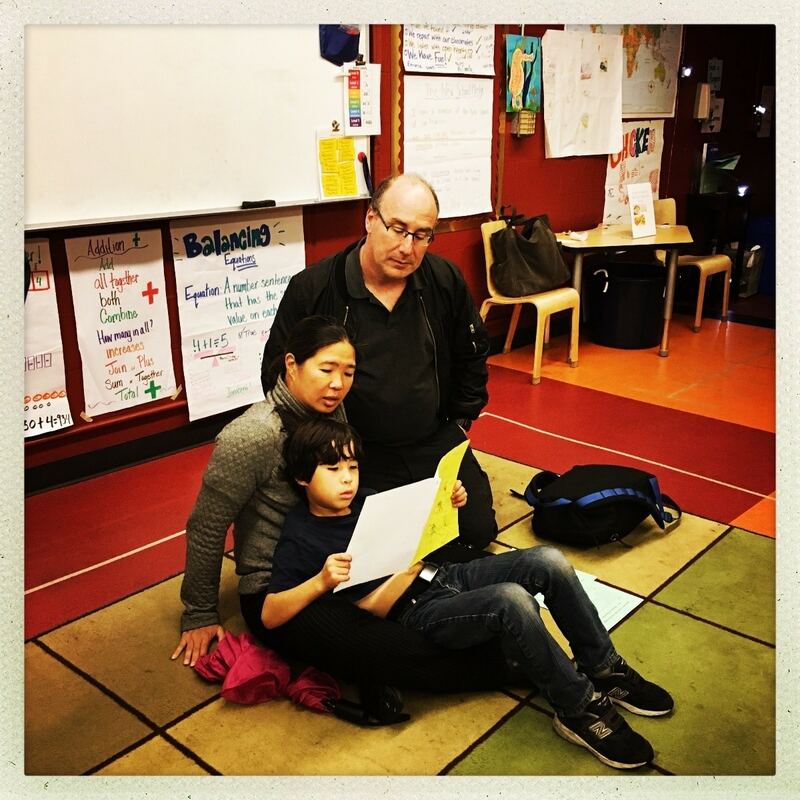 I’m a parent of two boys, both attending the New School of San Francisco, a newly established public charter school. What first attracted my wife and I to the school was their embrace of inquiry based learning as a core of their instructional philosophy. We got to know the founding team as they prepared to open the school, and formed part of their first class. Over the past 4 years, we’ve watched as the school has grown, and experienced first hand what it means to our children’s growth and education. This article discusses some of the things we’ve observed about the program, and hope it is useful to other parents who are considering this as an educational approach. In a nutshell, inquiry based learning is a way of teaching, that is focused on creating learning skills, rather than simply transferring information. Though the core principles have been discussed for almost 100 years, it has been codified in its current form since the 1970s. Originally developed to support science education, it is now being used to support multiple subject areas. A great deal of the interest in inquiry based learning is driven by the fact that the world our children are growing up in is changing, and existing educational philosophies don’t seem to be preparing them for this new world. It is expected that careers and employment may change over the course of a lifetime, and hence the ability to adapt and learn in new circumstances will be very valuable. Moreover, there is some evidence to suggest that inquiry based approaches may be better at developing a fundamental understanding of some subject areas, such as science. Start with the outcome, not the tool. Inquiry based learning is focused on getting to understand a problem or subject area, by applying multiple tools. Understanding is verified by getting the students to present the results of their inquiry, using a variety of techniques and media. This doesn’t preclude specialized education in specific subjects or techniques, such as structured writing, analytical techniques etc – however, by showing their application, it reinforces their value to the student. Inquiry based learning integrates multiple traditional subject areas. Students are encouraged to apply what they have learned in subject areas including literacy, numeracy and others to research their inquiry topics. As a parent, I notice that when working with my children, it is important to pay attention to the appropriateness of a tool or technique, in addition to practice using the tools themselves. For example, inquiry principles are followed well before students start using computers or tablets, so that when these tools are introduced, there is a clear sense of how they can be applied. Without this, it is easy for computers to become a center of attention. 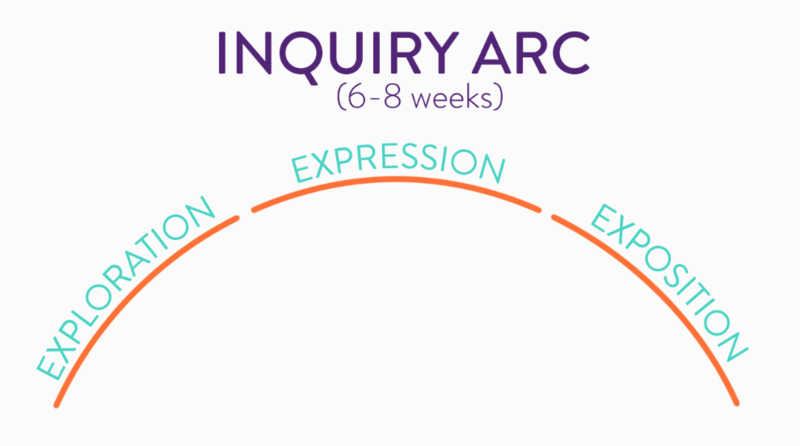 Inquiry based learning at the New School is used within various contexts, the most important of which is the “Arc”, a process which takes place over a trimester; students generally complete 3 arcs over the course of year. Inquiry is given dedicated time, but other subjects will also reference the inquiry arc. 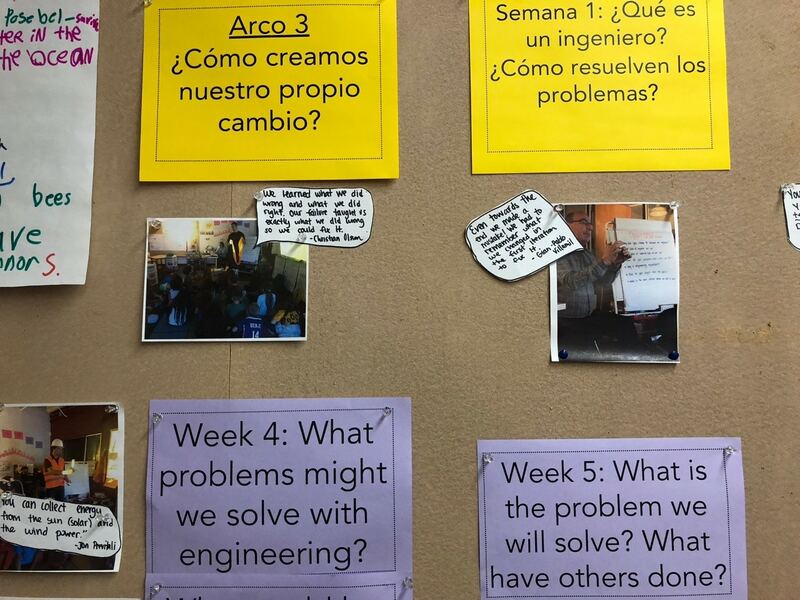 The arc starts by exploring questions that students have about the world around them. In theory, this is used to select an inquiry topic. In practice, teachers propose subjects from a smalle rset. This is because a “pure” inquiry approach could take a long time, and requires considerable work by teachers to prepare, since they can’t prepare detailed curriculum without knowing the subject. Good topics for inquiry are relevant to student’s lives, and able to encompass multiple subject areas. A key part of the inquiry is getting students to present their work. This is treated as a celebration, an Expo Night where students show off their work to the community. It is important that students get used to the idea of being able to apply and explain their work, since this is in itself a valuable skill. Expo Nights are an important event in the New School calendar, with all classes presenting their work over the course of two days. As parents, we are involved in preparations for Expo, but at the same time, the students are also excited to surprise us. After completing arc, it is typical to reflect on what worked well and what didn’t. This process of reflection involves the students, and is taken into account in the teacher’s own review and planning process for subsequent arcs. The choice of topics for an inquiry arc is key: it is important for students to be excited about it, and achieve the right balance teacher direction and student involvement. At the New School, for the younger grades, arc topics are chosen by the teachers, but as more senior grades are added, there will be more student involvement. All the arcs for a given class year share an overall theme: for example, all 3 of the kinder arcs are about community, and the first grade arcs are all about “changes over time”. However, even though the overall theme of the arc will be set by the teacher, they can evolve in different ways. For example, two kindergarten sections ended up taking the same topic in very different directions. They were both working on the arc topic “how does weather affect the community”. One section became very interested in the water (rain) cycle, and at the same time very concerned about the welfare of the homeless people they saw on their to the park every day. In order to bring these themes together, the kids decide to record videos of themselves as meteorologists discussing the weather cycle, made DVDs, sold them (mostly to family) and contributed the money to organizations that work with the homeless. Early stage brainstorming about topics & activities! The other section was very interested in extreme weather events, and also the story of the “3 Little Pigs”. For their expo, they combined both of their interests by designing and presenting pig houses designed to resist extreme weather (instead of wolves). A key aspect of inquiry based learning is the concept of completion: we are not just stockpiling knowledge or practicing techniques, but using them to reach an outcome. One aspect of completion is that students are prepared to demonstrate and explain their work. 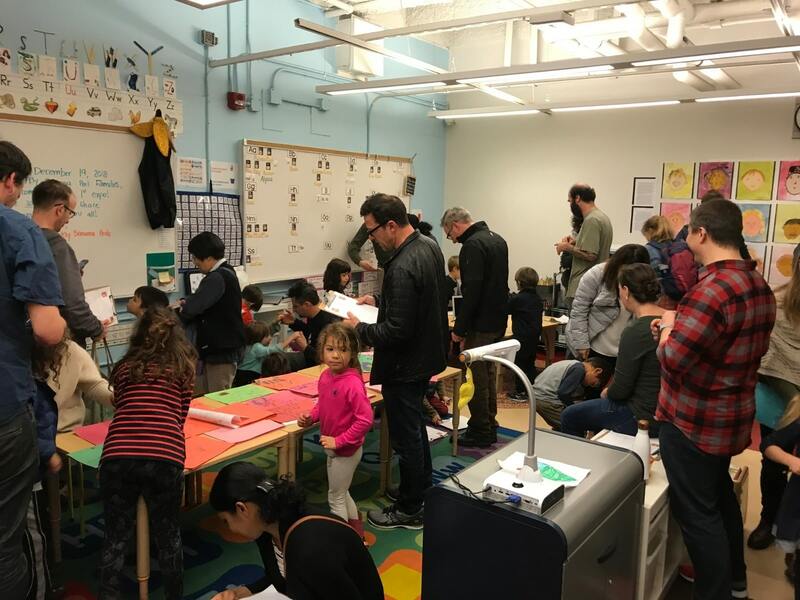 During Expo Nights, parents (and other visitors) are given a “passport” or a checklist, to encourage them to approach students and ask about their work. Another important part of the inquiry process is documenting results, both individually and as teams. Student materials throughout the arc are gathered together, and each student brings home an organized notebook after the Expo Night. 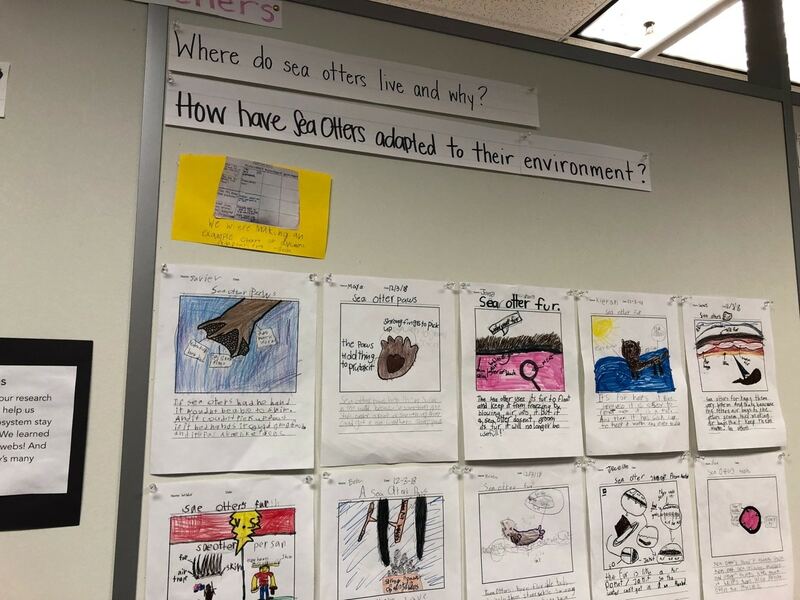 Interestingly, as students start to work with technology in the classroom, they use a similar approach to organize their online and digital documentation. It is impossible to roll out an inquiry based learning program without making other changes. Traditional educational approaches make implicit assumptions about the role of the teacher and the source of their authority. These change quite a lot: the teacher shifts from being the sole source of truth, to being more of a learning coach. The teacher may not have all the answers at the outset, and works collaboratively with the students in planning the arc. First, the relationship between teacher and students is less hierarchical. 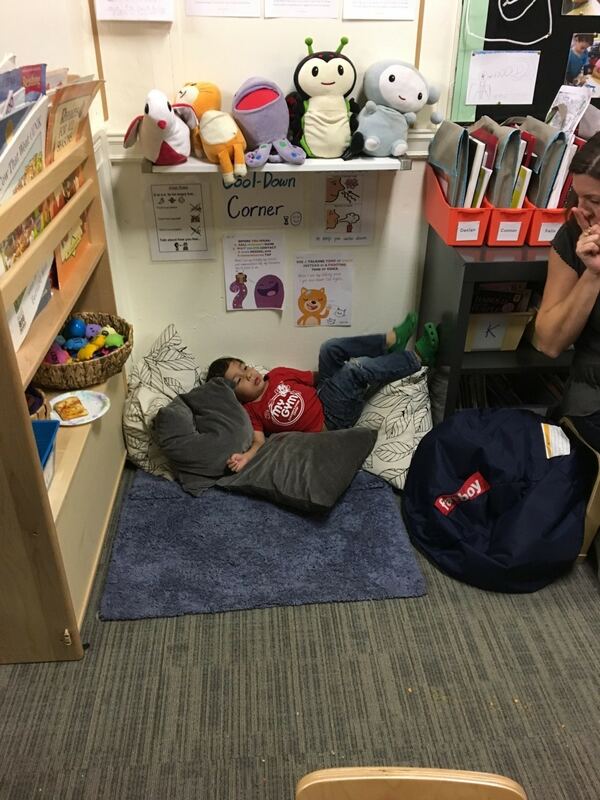 I have noticed at the New School that students are very comfortable engaging in substantive conversations with teachers on many subjects, and the relationship feels collegial. Second, given this change in role, it is necessary to rely on different approaches to maintain order and discipline. At the New School, this is not done through threats of punishment and promises of rewards, but rather by a constant reinforcement of the school values. Acting in accordance with the school values is acknowledged with “glow” cards that kids appreciate, whereas actions in contradiction to values are met with a “grow” card, an opportunity to reflect on consequences and modify behavior. These principles can be applied in other situations, but are essential for inquiry-based learning to work. As a parent, it is important to understand these approaches, and support them at home. In my experience, observing the styles of interaction at the school have certainly influenced how we reinforce key behaviors at home. For example, encouraging children to contemplate how their actions affect others (both positively and negatively) is a recurring theme in our life. A challenge with inquiry based learning is how to incorporate subjects where a certain amount of practice and memorization is important. For example, basic reading, writing and arithmetic skills require a degree of repetitive practice to become automatic. I’ve noticed that programs that started out as 100% inquiry, such as Brightworks, have gradually incorporated more traditional approaches in some subject areas. The inquiry arc will still refer to and apply these subjects, but time is spent reinforcing these skills. The New School has taken a hybrid approach since the beginning, and literacy/numeracy are given dedicated time and a different approach. The New School does not issue traditional homework, however students are given assignments to complete over the course of the week. This helps keep parents informed and engaged with the current subjects their children and working on. In addition, assignments related to the inquiry arc allow students to set up some self-directed activities, that can involve their families. Why did my wife and I choose an inquiry-based program for our children? We were very impressed with our initial contact with the school team, even before the school opened. They had a very clear vision for what a school could be, addressing the challenges of education in a changing environment. Not only did they have a strong focus on critical thinking, problem solving and collaboration, they also had a clear plan in place for measuring the impact and outcomes of the program. Students (including our two boys!) are excited to be at school. They look forward to it, and are enthusiastic for the day ahead. The relationship with the teachers is strong and supportive. Students feel like they are able to discuss many subjects with them, and this translates into a fearless, yet respectful, attitude towards other adults in the community. Our approach to discipline at home has inherited many of the values-based approaches from the school. Teachers are excited and positive: as the head of school told me, they are teaching the way that they want to teach. There are challenges too, in particular how we deal with building skills that require repetitive drill and practice. Sometimes you just have to put in the time and effort to practice. However, the payoff when kids are able to apply a learned to skill to a broader challenge is very noticeable. Did you find this article useful? If this resonates with you, and if you have any comments or questions to share with us or GP, we’d love to hear from you! Let’s connect over email, here. 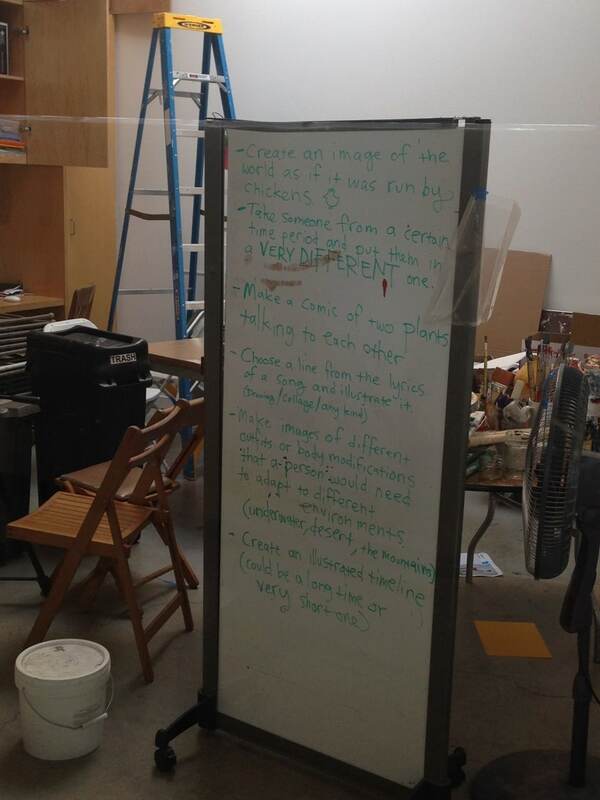 Previous Post #CodeintheCommunity: When we teach kids how to code, what do they learn, really?